What happens when you want to chow down on a classic southern po’boy and have your burger all at the same time? This. 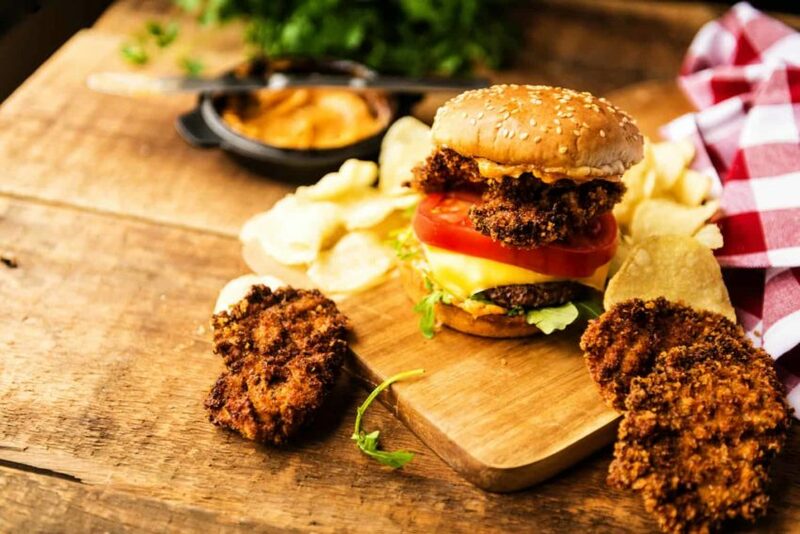 The Panko Fried Oyster Bayou Burger. Go big or go home. 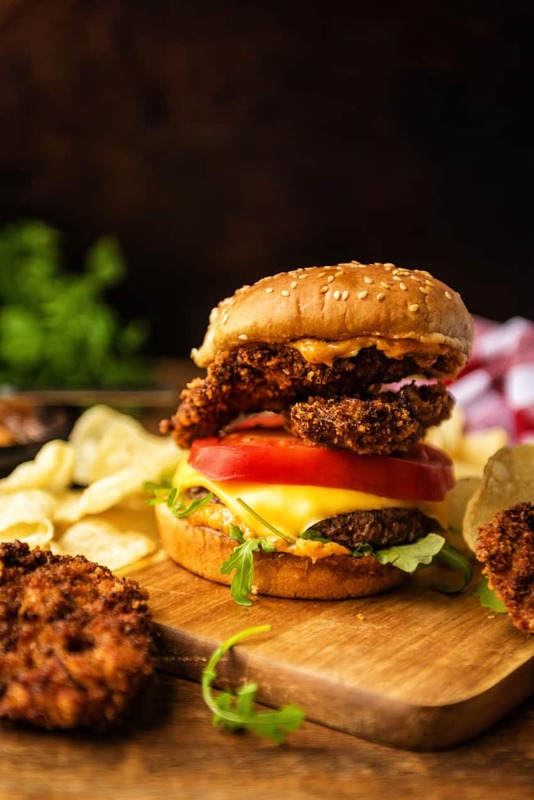 This post was sponsored by Tony Chachere’s No Salt Seasoning Blend, however my love of burgers, opinions expressed and recipe featured in this post are all my own. Because, burger love. Am I right? There I was dreaming a little southern dream of fresh gulf seafood, crunchy fried bites and just the perfect bit of spice to hold it all together. Inspired by a big box of love that Tony Chachere’s sent my way, filled with their new No Salt Seasoning Blend. I love a ‘no salt’ added product because I season as I go so that things are just the way I like them. Seasoning with salt changes, based on what and how you are cooking. People tend to lack seasoning throughout their cook and then have a sodium overload at the dinner table. Me? I work it in, tasting and testing as a recipe develops for just the perfect flavor. And as a bonus, no salt products are a Godsend to those who have heart conditions and need to really monitor their sodium intake. This No Salt Seasoning Blend is perfect for that. All the zest of a great blend to flavor things, with me in the driver’s seat for the salt portion. 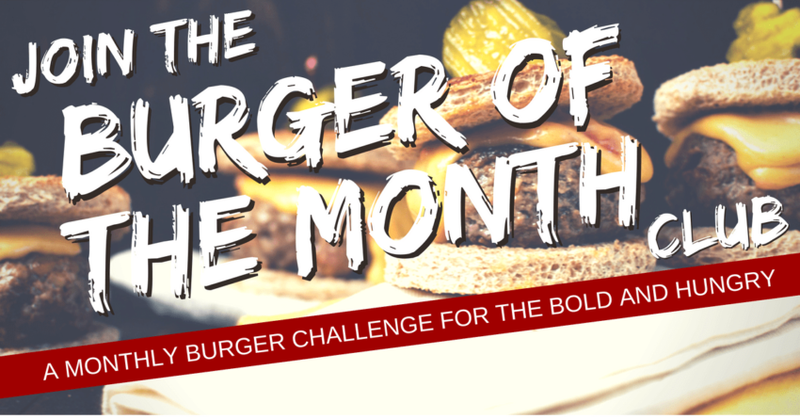 After drooling over some real gulf coast food memories, I decided to go classic GirlCarnivore and throw down an epic burger to celebrate. 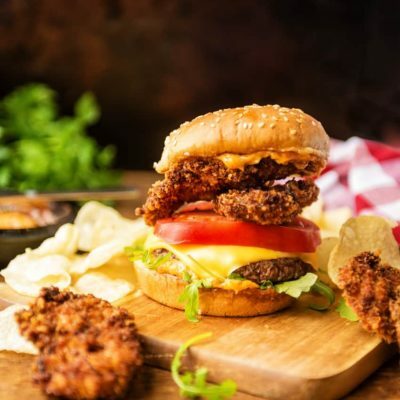 A thick all beef patty topped with crispy panko fried oysters and a toasted bun slathered in my secret weapon – a custom aioli – loaded with spice, was everything I dreamed it to be. And now I am sharing this gem with you. Some other ideas for this No Salt Seasoning Blend? Oh, given its timing, etouffee, red beans and rice, gumbo, adding it to a blackening blend for this killer mac and cheese. Yeah, the list goes on and on and I have a feeling I am just getting warmed up. Southern foods, especially those with roots in the gulf regions, have always held a special place in my culinary curiosities. Let’s see what else I whip up this season. 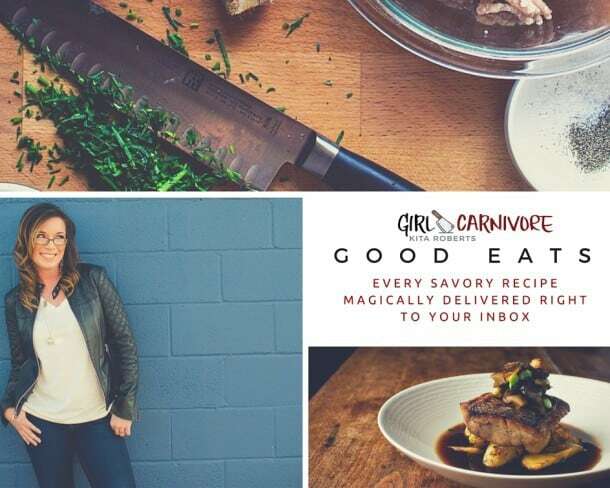 Follow along on Instagram for all the behind the scenes peeks at what’s going on in the GirlCarnivore Meat Labs. 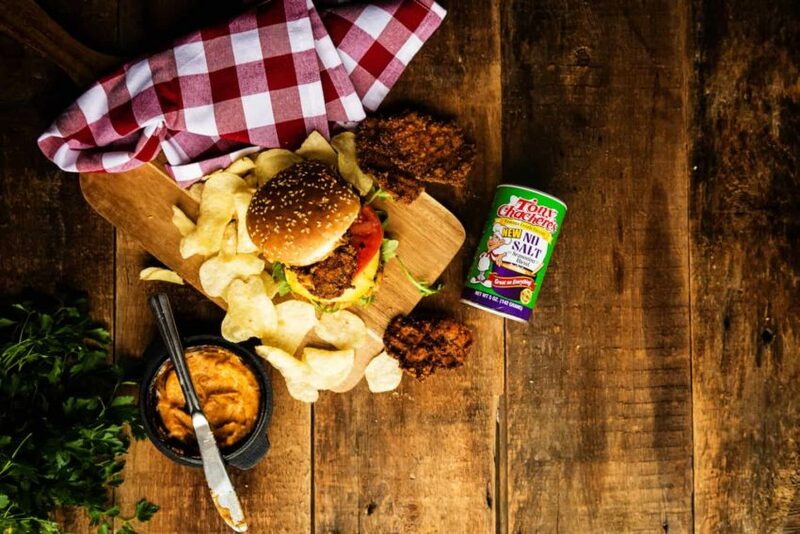 Want to get your hands on some of the Tony Chachere’s No Salt Seasoning Blend? Check out this sweet coupon code KITAFREE15 for Free Shipping on orders of $15 or more. For the Fried Oysters: Arrange your workstation for ease of flow and minimal mess. Mix the panko and Tony Chachere’s No Salt Seasoning Blend in a bowl. Add the flour and a pinch of salt and pepper, if desired, to a large resealable bag. Whisk the eggs and buttermilk together in a bowl. Take each oyster and toss them into the bag of flour, closing the bag, and shaking to coat evenly. One at a time, using tongs, removing the oysters from the flour, shaking off any excess as needed, and dredge in the egg wash. Drain the oyster of any excess egg and place into the panko seasoning mix. Coat and flip. Gently press each side once an initial coat is on to make sure there is a good panko coating clinging to the oyster. Arrange on a wire rack and place in fridge for 2 to 6 hours before frying. When ready to fry, heat 2 to 3 inches of oil in a large Dutch Oven, making sure to leave at minimum 1 inch from the surface of the oil to the rim of the pot, to 350 - 375 degrees, monitoring the temp with a heat and cook safe thermometer. With a slotted spoon, carefully place 3 to 4 oysters in the pot. Fry 2 to 3 minutes, flipping as needed, until golden and cooked through. With a slotted spoon, remove from oil, drain and let sit on a wire rack to cool. Sprinkle with a touch of salt, if desired. Repeat with the remaining oysters, being careful to adjust the heat as needed to maintain the oil temp. For the Burgers: Clean and oil grill as needed and preheat to medium-high heat for offset cooking. Prep your burgers by seasoning lightly with salt if desired and cook to the desired temp. Check off heat for 130 - 135 for medium rare with an instant-read thermometer. 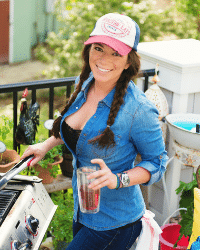 Move burgers to the top rack of the grill where it’s cooler and arrange slices of cheese atop. Close the lid and let melt 30 seconds to a minute. Meanwhile, brush the melted butter over the buns and grill or toast to a light golden. Add a dollop of zesty mayo to the bottom and top buns. 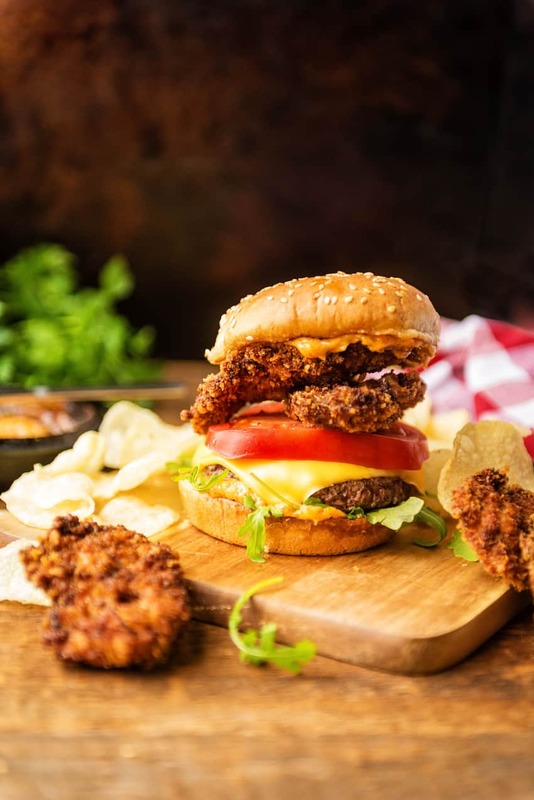 Starting with the bottom bun, arrange the layers starting with the lettuce, a cooked patty, next arrange the tomato, two fried Panko Fried Oysters and finally, top with the remaining bun half. Serve fresh, hot and with napkins! 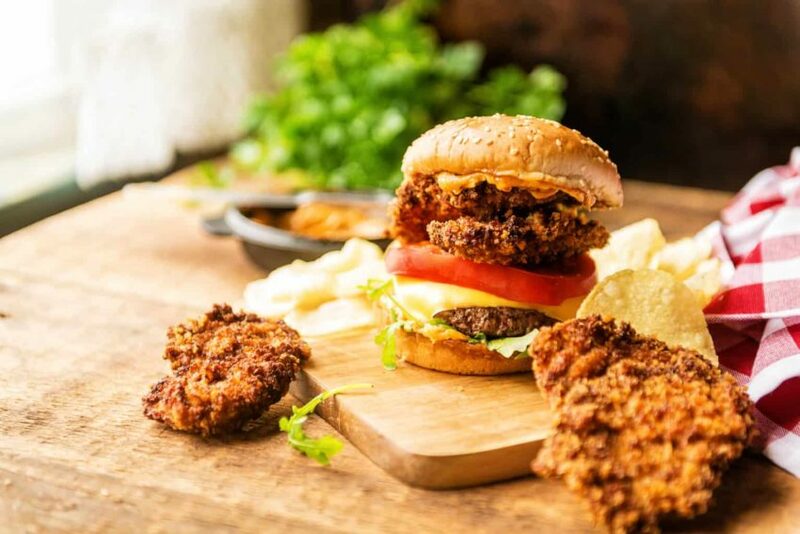 This recipe is best with the oysters and burgers coming off hot at the same time so everything is fresh and hot when served. Keep in mind your oysters will need to sit for several hours before cooking, so prep them ahead of time.